Join the Harvard Club of Southern California in welcoming two of Harvard’s most prestigious a cappella groups as they return to Los Angeles. 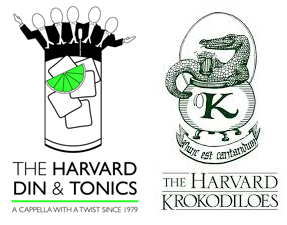 The Harvard Din & Tonics and the Harvard Krokodiloes will be performing at the Westwood Presbyterian Church at 7:30pm on Friday, January 12. THIS EVENT IS SOLD OUT. NO TICKETS WILL BE AVAILABLE AT THE DOOR. SORRY! This will be the groups’ second annual Wintersession visit to the Southland. Last year’s concert was completely sold out, with people turned away at the door, so we encourage you to buy your tickets now. All tickets MUST be purchased in advance. The cost is $15 for members, $30 for non-members. If you are not a member of the Club, this is an excellent opportunity to join us. Annual membership is just $25 for recent graduates, and as low as $45 a year for everyone else (with purchase of a three year membership), so if you buy three tickets, it’s like getting your membership for free. The Harvard Yardbirds, L.A.'s Harvard alumni a cappella group, will be opening the concert with a few songs. We will also host a post-concert wine and cheese reception at which you'll be able to meet the singers and purchase copies of their latest CDs. Parking: Parking is free at the church on a "first come first serve" basis. Self-parking is also available next door at the Avco Center/Ipic Theater at 10840 Wilshire Blvd.